After a Republican victory in the Presidential Election of 1860, the South park of Mt. Vernon Place seceded from the union... of the parks. 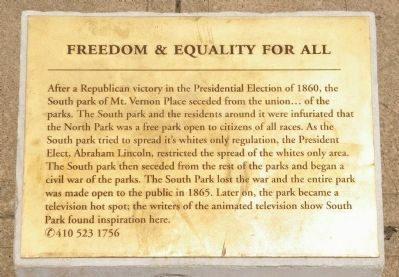 The South park and the residents around it were infuriated that the North Park was a free park open to citizens of all races. As the South park tried to spread it's whites only regulation, the President Elect, Abraham Lincoln, restricted the spread of the whites only area. The South park then seceded from the rest of the parks and began a civil war of the parks. The South Park lost the war and the entire park was made open to the public in 1865. Later on, the park became a television hot spot; the writers of the animated television show South Park found inspiration here. Location. 39° 17.801′ N, 76° 36.937′ W. Marker is in Baltimore, Maryland. Marker can be reached from Washington Place. Touch for map. Marker is in this post office area: Baltimore MD 21201, United States of America. Touch for directions. To George Washington (within shouting distance of this marker); Lafayette Monument (within shouting distance of this marker); The Peabody Library (within shouting distance of this marker); The Peabody Conservatory (within shouting distance of this marker); Hackerman House (within shouting distance of this marker); A Monumental Honor (about 300 feet away, measured in a direct line). Touch for a list and map of all markers in Baltimore. This "historical marker" was one of seven installed by Maryland Institute College of Art sophomore Daniel Allende as part of the 2008 exhibit Beyond the Compass, Beyond the Square. While marker text has some basis in truth, exaggerations become quickly apparent when one takes the time to read the text. 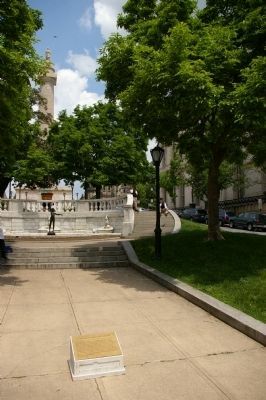 In addition to the insight the marker provides about the history of Mount Vernon Square, it also helps to illustrate how often historical markers are taken for granted, almost unseen, and how they could say most anything, yet still be unnoticed. — Submitted June 4, 2008, by Christopher Busta-Peck of Shaker Heights, Ohio. More. Search the internet for Freedom & Equality for All. Credits. This page was last revised on June 16, 2016. This page originally submitted on May 16, 2008, by Christopher Busta-Peck of Shaker Heights, Ohio. This page has been viewed 1,605 times since then and 14 times this year. Photos: 1, 2. submitted on May 16, 2008, by Christopher Busta-Peck of Shaker Heights, Ohio.